Percutaneous Nephrolithotomy (PCNL) India offers information on Percutaneous Nephrolithotomy (PCNL) in India, Percutaneous Nephrolithotomy (PCNL) cost India, Percutaneous Nephrolithotomy (PCNL) hospital in India, Delhi, Mumbai, Chennai, Hyderabad & Bangalore, Percutaneous Nephrolithotomy (PCNL) Surgeon in India. You need either general anesthesia or regional or spinal anesthesia during this procedure. 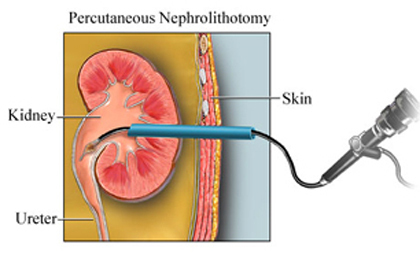 A small tube (catheter) inserted into the kidney will drain urine until the kidney heals. These procedures are technically difficult.